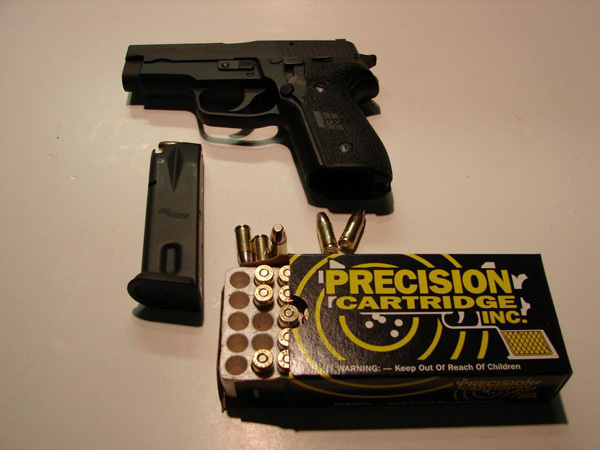 Precision Cartridge, Inc. - Total Copper Jacket Bullets - Ammunition in 380, 9mm, 38, 357 Mag., 357 Sig., 10mm, 40 S&W, 41, 44, 45. Precision Cartridge, Inc. uses Total Copper Jacket ("TCJ") bullets. The most widely cited benefit of using Total Copper Jacketed ("TCJ") bullets in shooting ranges is the dramatically reduced lead vapor levels that will result. However, TCJ bullets have several other important benefits as well. First, TCJ bullets will not cause the damage or premature wearing of range backstops that traditional full metal jacketed bullets will. TCJ bullets are constructed of relatively soft, thin, pure copper electroplated jackets (the jacketing is so soft that when separated from the lead bullet core, it can be easily bent back on itself just using two fingers). Hollow point bullets are especially kind to backstops because their hollowed noses are more compressible than are the solid noses of similar weight bullets. In contrast, the rigid, abrasive jacketing metal of traditional full metal jacketed bullets can cause rapid backstop wear. As a result, full metal jacketed bullets are not permitted to be used in many ranges. An additional benefit of TCJ bullets is that they will not result in the ricocheting that is common among traditional jacketed bullets. The thick, rigid jackets of such bullets can break away on impact with the backstop and cause potentially dangerous ricocheting. TCJ bullets do not pose the same problem. In numerous tests over a period of years in both the U.S. and Europe, TCJ bullets have been shown to essentially eliminate ricocheting problems.